Fatima Mixon's family. (l to r) Kevin, Myra, Kyra, Fatima, and Makell. William F. Jones, CEO, Focus: HOPE. “When folks come out of here with that Focus: HOPE stamp of approval, you can be certain that you’re getting somebody who should work out pretty doggone well in your workplace,” said William Jones, CEO of Focus: HOPE. But there’s a lot to learn before getting to the workplace. I sat with a class for a few moments watching as individual students were called up front to read a gauge. "Very good," the instructor said warmly. The entire class applauded. This is critical stuff. When you have to measure a piece of metal being turned on a lathe or milled down for a part that has to be accurate down to a thousandth of an inch, you have to be able to use tools such as a micrometer caliper inch gauge machinist measuring tool. Instructor Gholam Reza (known as Mr. Ray by students) is demonstrating turning stock on a lathe at Focus: HOPE's machinist floor. Just being in this class puts these students ahead of the crowd. Depending on the class, only half to two-thirds of applicants are accepted – many fail the drug test. Only about 80 percent of the accepted applicants pass the entrance exam. Rashida Goudeaux ‎is the Director of Workforce Development & Education at Focus: HOPE. “Although they may have a high school diploma, many people are placing below 12th-grade math and reading and in many cases are at fourth- and fifth-grade levels. So, that seems to be a big challenge,” she explained. Those who don’t make it do have the option of basic courses to get up to speed. Fatima Mixon is a student machinist who got through the entrance exam. She says there was still math waiting for her. Most students pay little or nothing to take these classes. But getting through the application process and passing the entrance exam are just the first couple of hurdles for some Focus: HOPE students. Some are homeless. Some don’t have the appropriate clothes to go to class or to go on a job interview. Some need eyeglasses. Some don’t have a way to get to class. Focus: HOPE either helps directly or works with partners to get students what they need to live and get to class. The idea is you can’t successfully train someone when everything else in their life is working against them. Basically, you have to do what you’ve got to do to get where you want to be. And, if that means you’ve got to leave out of the house an extra hour, hour-and-a-half early to do what you’re trying to accomplish, then that’s what you’ve got to do. Fatima Mixon was given bus passes and transfers so she could make it to classes. In Detroit, even that’s something of an obstacle. The bus system is not always reliable. “Basically, you have to do what you’ve got to do to get where you want to be. And, if that means you’ve got to leave out of the house an extra hour, hour-and-a-half early to do what you’re trying to accomplish, then that’s what you’ve got to do,” Mixon said. She says she's determined to get that certificate to become a floor machinist. She says, yeah, the machinist training is important, but so are the soft skills. Students learn everything from how to properly shake hands, to working as a team, to getting through a job interview successfully. “I’ve tried to go out here and just get a job. And usually it’s harder, especially if you don’t have too much work experience by me being sort of a stay-at-home mom, so I have a sketchy work history, but getting the training and, you know, going through the interview process, and they help you with all that type of stuff it helps. It helps,” Mixon said. A few weeks after I first met Fatima Mixon at Focus: HOPE, I visited her and her family at home. It was just after a big snowstorm in Detroit. Fatima’s youngest, Makell, was shoveling snow and let me know I’d found the right place. I climbed the off-kilter concrete stoop to the house they rent. Inside, Fatima’s daughter, Kyra, was curled up near a space heater. She’s in high school. That’s old enough to have opinions, right? I asked what she thought about her mom’s decision to take classes to help her get back into the workforce. “I think it’s a good idea that she should do it and she will – I think she will get a job,” Kyra said enthusiastically. Fatima is 36 years old. She hasn’t held a job for several years. She’s been a stay-at-home mom. “Finally. Yeah. It’d been a while for her. I’m proud of her. She actually stuck to something and now she’s about to complete it." He then smiled again and looked at Fatima. "I might ask her to borrow something to eat,” and he laughed again. Kevin is working and attending Henry Ford Community College. He had been going to Notre Dame College on a football scholarship. “But, we had some financial problems so I ended up having to come back home and go to Henry Ford,” he explained quietly. It turns out playing football for the Falcons didn’t cover everything. Fatima says they didn’t realize that. “Well, you know, the scholarship, you know, kind of messed up. It wasn’t a full scholarship and so when it came to our end to be able to pay, we couldn’t afford it. It was like $400 a month, you know. We couldn’t afford it," she said. 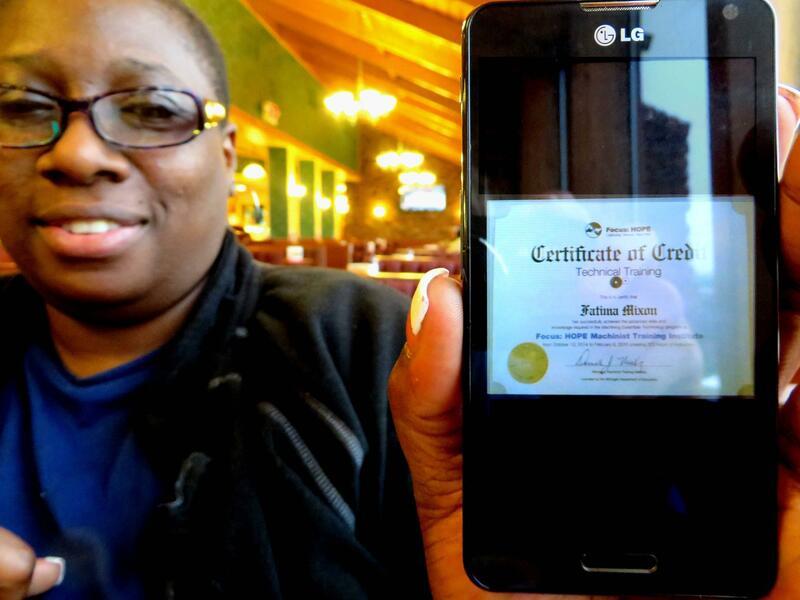 Fatima Mixon and a photo of her certificate on her phone. Fatima would like to see Kevin eventually go to Wayne State University. She worries that if her son keeps working to support the family, it will make it difficult for him to get there. So, she wants to make enough to let him hit the books without the distraction. When we visited that day, Fatima was getting close to finishing her classes at Focus: HOPE. She was hoping the training would mean a decent job soon. “I’m putting a lot of applications everywhere. I’ve heard a few things back, but nothing really solid, so … hopefully real soon I’ll be working,” she said. She's upbeat. She seems optimistic. In the meantime, she and her three kids are living with her mother. Myra Mixon is 56. She’d been the primary wage earner for the family, but a couple of years ago she got COPD, a respiratory illness. She now relies on an oxygen tank. “Right. And I’m now currently getting disability, but I use all my disability to pay for the rent. And my grandson, he helps out. But, when she gets a job, she’s going to take care of business. But, that’s what I do right now, just, I use all of it to take care of the house,” Myra said. Myra worked for a long time. She knows it takes some drive to keep going. She’s been gently nudging, encouraging Fatima to finish the training she needs to get back into the workforce. “And I told her ‘Just keep your head up. It’s hard work, but you got to keep going. You got to keep going.’ I’m so proud of my daughter; I can’t put it into words,” Myra said. Fatima knows the expectations of her kids, the expectations of her mother, the expectations she’s put on herself and meeting all of them will determine the future of the family. That's a lot. If you live in Detroit, getting a job is just the first hurdle. Sometimes you have to be incredibly resourceful just to get to work. After finishing her training at Focus: HOPE to become a machinist, Fatima Mixon did not find a job in the city of Detroit. But she did get a job in Warren, Michigan. She was put on the midnight to 8:00 a.m. shift. Shift work is the worst for people who need to take the bus to work. The buses don’t run overnight. I got together for breakfast with Fatima recently after she got off work. Fatima got really, really lucky in finding a way to get to work. Fatima Mixon's mother bought a lotto ticket which paid out $2000. 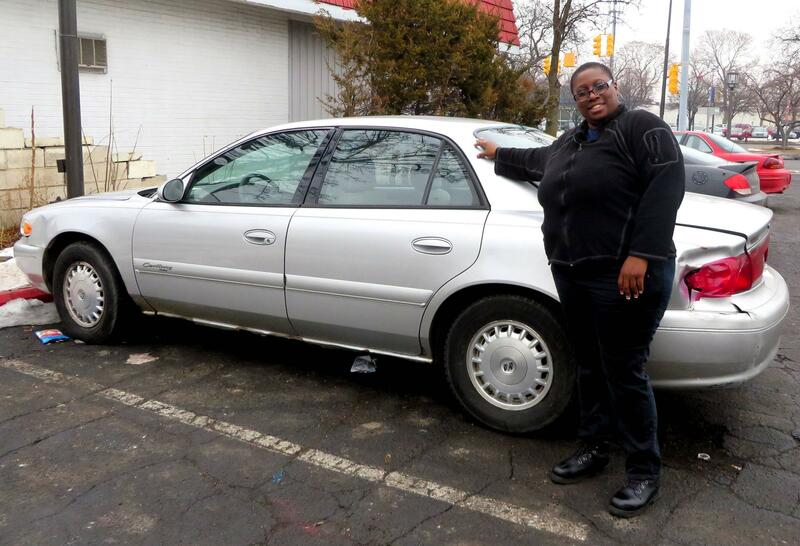 She bought her daughter a 2002 Buick Century so she could get to her new job. “Yes, I was able to purchase a car. My mom actually had some good fortune. She played the lottery and won. And what she did with her winnings is gave me the money for me to buy a car,” Mixon explained. Her mom won a couple thousand dollars. Fatima got a 2002 Buick Century for $1,500 to make the 20-mile drive to work. Her machinist job is at the Chassix plant in Warren. Chassix supplies Ford, GM, and Chrysler with parts. Starting pay is $11 an hour, but Fatima gets a shift bonus of 30 cents an hour. Chassix employees also get medical, dental, and vision coverage. Fatima says she’s been volunteering for all the overtime she can, sometimes working seven days a week. “I try to catch up on a few bills here and there. But just to be able to do that, I’m okay. My daughter’s got a birthday coming up and so she’s so excited, like, ‘Mom, can you get me this; can you get me that; can you get me this.’ So, we’ll see how that works out for her,” she said. Over omelets and orange juice, we talked about how her job was going. “I like it. I like it. I do. Actually, I’m doing everything that they taught us at Focus: HOPE,” she said, smiling. Chassix has hired a couple of dozen Focus: HOPE students over the years. The Chassix plant in Warren, MI where Fatima Mixon was hired. Mary Sheppard is a human resource manager with the company. She says the students come in with the required skills, they catch on quickly, and they usually work out well. “Have we had 100 percent luck with all of the employees? No. But, I think for the most part I think it’s a wonderful program. And they’re really good to work with. And, again, it’s nice to have people come in with some sort of skills,” Sheppard said. 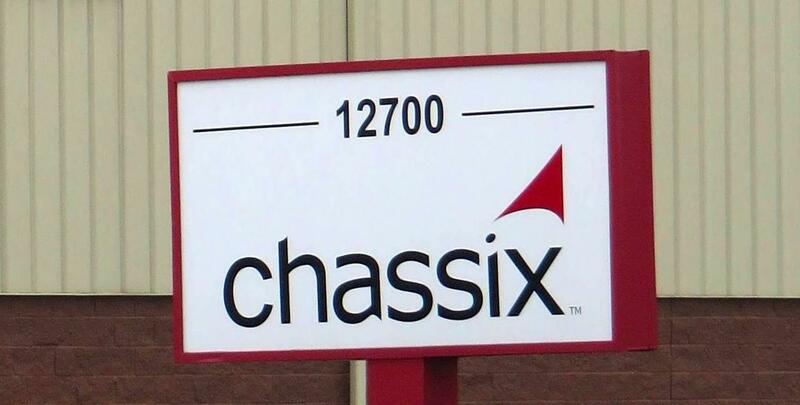 There’s only one problem: Chassix, with seven plants in Michigan and others around the world, has filed for bankruptcy. The company is controlled by Detroit Pistons owner Tom Gores. Reports indicate the Chassix plant will keep up production during the bankruptcy restructuring. That should keep Fatima Mixon and 1,200 other Michigan workers on the job. She says she’s optimistic everything will work out. She doesn’t want to think about going back on welfare. She says money is so tight she has to choose between paying the heat bill and paying rent. “So, you know, sometimes things happen, you get evicted, have to go stay with someone else. And, it gets hectic there because it’s less space than you already had. And you’re intruding on somebody else’s space and that strains relationships and things of that nature. It’s pretty bad. It’s pretty bad,” her voice trailing off. Instead of worrying about losing her job, she’s making plans. She’s thinking about her kids and their education. She’s thinking about not needing her mom to help out with expenses. How her mom might be able to get her own place. At 36 years old and with three kids, Fatima Mixon got the training she needed, got a job, and is grabbing the future. With more jobs requiring more advanced skills, it’s the kind of story many Detroit residents will have to pursue if the neighborhoods are to share in the prosperity that much of Detroit’s downtown is already experiencing. *Correction - An earlier version of this story said Kevin attended University of Notre Dame on a football scholarship. He actually attended Notre Dame College in Ohio. The story above has been corrected. *This story was originally presented as a three-part series. It is presented here in its entirety for your convenience. Support for the Detroit Journalism Cooperative on Michigan Radio comes from the John S. and James L. Knight Foundation, Renaissance Journalism's Michigan Reporting Initiative, and the Ford Foundation.